Today I drove downtown to buy avocados. Why so far? As I explained to DH (after 20 years you would think he knew already) that I take my avocados seriously (heh I'm from the Caribbean) and I needed a half dozen to prepare for a picnic tomorrow. It was pointless to buy them at the local grocer rock hard or rotting. Downtown where there is a higher concentration of avocado afficianados you can buy them in varying states of ripeness within one greengrocer or amongst three on the same block. For some reason downtown also seemed to be twice as hot as my back yard -- like a concrete oven. Anyway to improve my stamina and disposition for the choosing of perfect avocados and guacamole ingredients I decided to dip into the air conditioned basement of a discount book seller. At one point I picked up a new copy of a baby knitting book that I have borrowed often from the library. I carried it for 10 minutes and put it back (haven't I memorized those patterns yet?). In the basement I was confronted with the ultimate temptation: a table loaded with vintage needlework books. There was a copy of the Simplicity sewing magazine (sewing for teens) that I used when I was learning to sew at the age of 12. There weres two stacks of "Golden Hands" books (I loved browsing through those books as a teen). They are like an encyclopedia of needlework techniques, but each volume contains a variety of techniques with no order that I have ever figured out. It looks like something that may have been sold as a series, issued one at a time, each containing something for everyone (who could hold a needle). There were macrame books and issues of Mccalls magazine. I already own many of these and I began to feel guilty even looking. I thought of my stacks of magazines and books at home, like the one pictured above. It was published in 1952, and still has its 15 cent price sticker from Woolworth's. 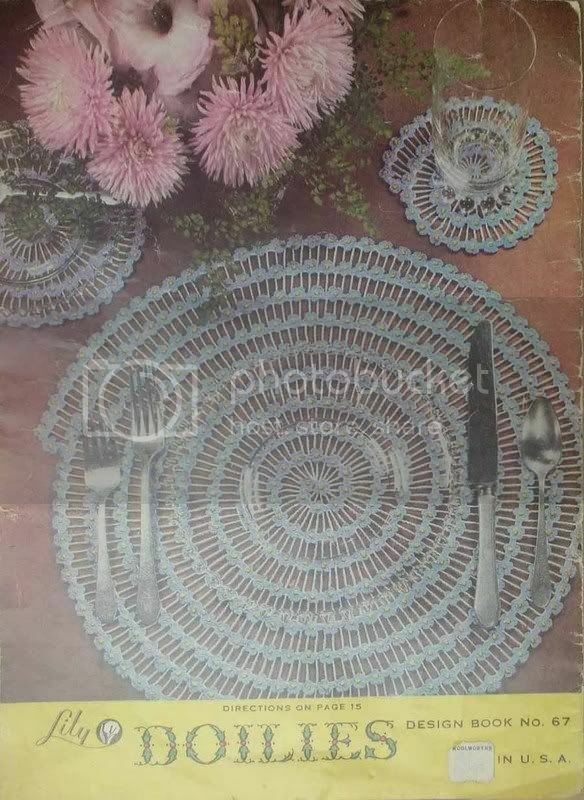 I don't remember where I got it from but I was attracted by the crocheted "forget-me-not" spiral placemat set on the cover. I love for-get-me-nots. I love them so much that I let them cover the vegetable bed like a blue carpet every spring (I clear them when I am ready to plant but they seed so much that they come back again every year). The forget-me-nots on the magazine cover are crocheted as a braid that is applied to a spiral grid or "filet". Even the idea of a grid that is a spiral rather than a rectangle gives me a thrill of inspiration. Anyway I plan to make the forget-me-not braid and apply it to something this summer. posted by Scheherazaad @ 7/07/2007 08:34:00 p.m. I love McCalls! Which store were you at? Yvette, I went to BMV at Bloor and Brunswick. the colorpalette on this cover is truly wonderful. have a great picnic today.